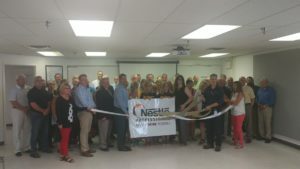 A ribbon cutting on Tuesday celebrated Nestle’s official purchase of the former Conagra factory in northwest Missouri’s Trenton. The ceremony symbolizes a path forward for the community of 6,000 people on the brink of losing its largest employer. The town was headed down a dark path earlier this year when Conagra began making final plans to close its factory there. Some 200-300 workers were preparing to face the unemployment line. The planned loss of Conagra caused utility rates to spike. Then, Nestle changed what could have been an economic nightmare for the area. In April, the company announced its intentions to buy the plant and keep the assembly line going with little disruption. What had been a gloomy place for the past two years suddenly gave the people in the area a morale boost. About 75 people gathered Tuesday to celebrate Nestle’s takeover of the former Conagra factory. Rick Klinginsmith with Farmers Bank of Northern Missouri in Trenton was among the crowd of supporters. He tells Missourinet the last two years have been a rollercoaster ride for the area. Mike Voorhies, the plant’s union president, says morale is a night and day difference from two years ago when Conagra announced its plans to close the site. “We’re working five days a week instead of seven days a week. We’re seeing our families more. We’re getting to do more,” Voorhies says. Klinginsmith hopes Nestle’s efforts will improve the county’s unemployment rate currently hovering over 4%. The factory includes 150 full-time employees and 99% were previously Conagra workers. Two shifts, along with overtime, are underway at the plant. Nestle workers make an average of more than $41,000 annually. The company plans to continue operating as an organized union factory. Other dignitaries at the event included Republican State Rep. Rusty Black of Chillicothe, Republican Sen. Dan Hegeman of Cosby and former Democratic State Rep. Phil Tate of Gallatin.